Eagle Competition Rotating Assembly matches the Eagle ESP H-Beam Connecting Rods, 4340 Steel Crankshaft, and Premium Forged Pistons from companies like Arias, JE, and SRP. Competition Assemblies COMPLETE solution and are the perfect choice for the most demanding applications. Eagle Street Performance Assemblies offer the perfect balance of performance, reliability, and affordability for engines under 500 hp. Each kit includes a cast steel crankshaft, SIR I-beam connecting rods, forged or hypereutectic pistons, plasma-moly rings, and Clevite77 bearings. Eagle Street & Strip Assemblies offer the perfect balance of performance, reliability, and affordability for engines under 500 hp. 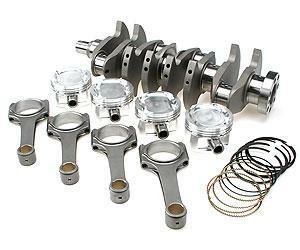 Each kit includes a cast steel crankshaft, SIR I-beam connecting rods, forged or hypereutectic pistons, plasmamoly rings, and Clevite77 bearings. Eagle Competition Assemblies offer the ultimate in strength and reliability at an affordable price. Each kit includes a 4340 steel crankshaft, H-beam rods, premium forged pistons, plasma-moly rings, and Clevite77 H series bearings. They are designed for internal balance. Standard bore is 4.000. Perfect for the most demanding applications. Eagle Competition Assemblies offer the ultimate in strength and reliability at an affordable price. Each kit includes a 4340 steel crankshaft, H-beam rods with upgrade ARP 2000 or L19 bolts, premium forged pistons designed specifically for forced induction engines, plasma-moly rings, and Clevite77 H series bearings. They are designed for internal balance. Perfect for extreme horsepower applications. Very good prices and good shipping prices. found my parts cheaper then any place else. Thanks to Autoplicity for filling my order #8498 of 4/02/12 quickly and accurately. I will be back. The item has not been delivered yet. But the email updates are great. And I found this much cheaper than elsewere.